Malmo Sturup International Airport (MMX) is situated 28 km / 17 miles south-east of Malmo and is served by the 108 road and the E65 (Börringe Kyrkovag). Signposted locally as the 'Malmo-Sturup Flyplats', the airport is located off the Sodra Sturupsvagen and the Bramstorpsvagen roads. Close to Malmo Airport, the vast Hackeberge nature reserve is located to the east, while Nötesjö, Börringe and Norra Grönby lie directly south. The journey time from Malmo to the nearby airport is roughly 30 minutes. 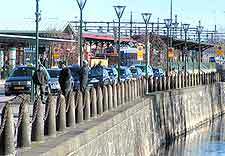 The main road routes into Malmo can experience some congestion during peak times of the day. Passengers are recommended to allow themselves adequate time to drive to Malmo Sturup International Airport if they are travelling during rush hours.